KidCo is another generous sponsor of our huge Summer Splash Giveaway. I've had my eye on their genius PeaPod toddler travel bed for a while! We love to go places and not get too tied down being home with kids, the PeaPod is the perfect solution for nap times and bed times on the go. It has lots of uses as we've discovered! 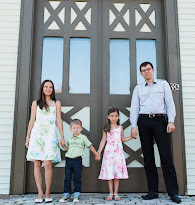 As I've mentioned in my Road Trips With Toddlers post, we are taking a road trip this month. We booked our hotel room just about two days too late! We wanted two queen beds but ended up with one king size bed as that was all that was left within our price range. We were left with the choice of either sleeping with both kids in our bed (yeah right!) or finding some sort of travel bed for Baby E so that we can actually rest. I was so excited when KidCo agreed to sponsor a review and giveaway for the PeaPod Plus! It arrived in a very compact, light box. We opened the package, then opened the storage bag that it comes in and we weren't really prepared for this, but here is what happened! Don't you just love how it opens?! We were startled by it and had a good laugh. I haven't seen a video of it so I wasn't expecting it! We then inflated the mattress and placed it in the special compartment underneath the tent - a great design idea to keep the mattress safe and out of the inside of the travel bed. I should have captured Baby E's excitement when she first saw this, she absolutely loves it! Nearly everyday she would beg me "Mommy, make me a house!" Now she has one of her own, it is a perfect play tent as well and I'm sure someday we will take it camping too. If I want her to get creative and build her own fort, I can just easily fold this and it is put away in seconds! 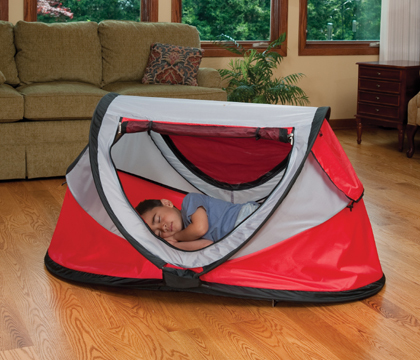 It's the perfect play house, travel bed, and camping tent. It will be handy at the beach too! 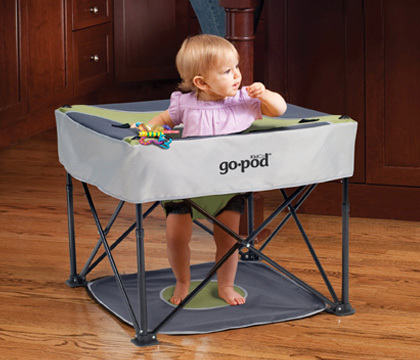 Another great travel product they carry that I absolutely love and maybe will try someday is the Go Pod. It is a lightweight, portable activity seat. I have a love/hate relationship with most baby gear because even though I find it handy, in our small living space there just isn't enough room for baby things - I've become a huge fan of things that fold compactly! Baby T is 6 months in a few days and he is enjoying 'standing' on his very strong legs, but he doesn't like to be in the highchair for long, he is too big for his Bumbo seat (and bored in it), and laying on his tummy last for only ten minutes at a time. This would be perfect for him while I cook, do dishes, or get some work done! When company comes over you can just quickly put it away. We love everything about the PeaPod Plus and the fact that it fold down to such a compact little package! There was only one thing that we weren't fond of and that's the 'new product smell'. It airs out quickly however and you can leave it outdoors for a little. The PeaPod Plus retails for $89.95 and they also have smaller travel beds perfect for infants, the PeaPod ($69.95) and PeaPod Lite ($39.95). Tell us what you think of the KidCo PeaPod Plus? It looks the like its the size of my reflector i use for photography, opens just like that and folds as easily back, very neat product love it. This is so neat!!! I love it! I'm sure the kids love it too because its like a little 'clubhouse' indoors without having to fold all the sheets back up after!